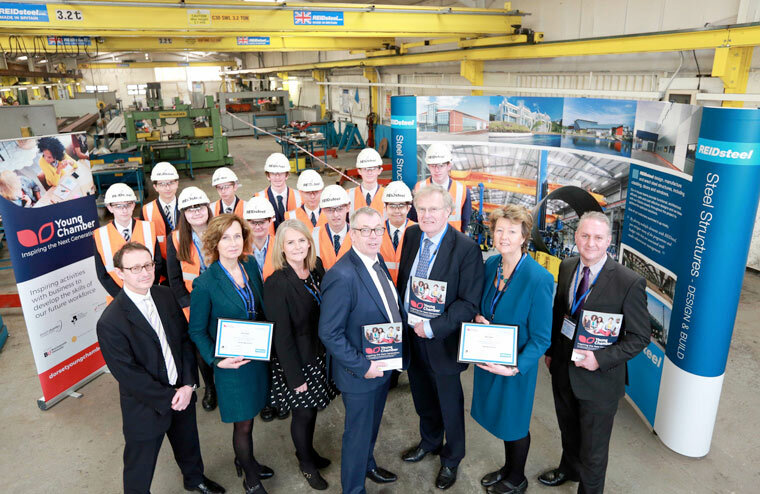 From left, chairman Tim Reid is pictured left with Jane Asplin (The Grange), Vicki Hallam (portfolio holder for economy at Christchurch Borough Council), Reid Steel managing director Simon Boyd, Chris Chope MP, Karen Dadds (Twynham) and DCCI chief executive Ian Girling with students. It was the first industry visit to a sponsor company since the launch of the pioneering scheme in September, to bridge the gap between education and business. Students and staff were welcomed by REIDsteel managing director Simon Boyd and chairman Tim Reid. Christchurch MP Chris Chope, DCCI chief executive Ian Girling and portfolio holder for economy at Christchurch Borough Council Vicki Hallam also joined the group. They heard about the 130-strong REIDsteel’s workforce and their wide-ranging work as a structural steel company, having the capability to design, ship and erect entire buildings anywhere in the world – from cathedrals in Central America and bridges in Africa to football stadiums and industrial units in the UK. Mark Bradbury, who is Quality, Health, Safety and Environment (QHSE) manager, and works manager John White led a tour. This included a presentation by managing director Simon, talks in the drawing office and demonstrations in workshops. REIDsteel managing director Simon thanked the Grange and Twynham schools for visiting and presented both with steel shields showing their school crests to mark the company’s sponsorship of their Young Chamber Programme membership. He said: “Our intention is to help the schools but we also want to encourage other companies to become involved in building links with education too. Any schools interested in joining the Young Chamber should contact Will Montgomery by calling 01202 714817 or by emailing Will.Montgomery@dcci.co.uk.